For some time now, The Motley Fool has been talking about an innovation that it thinks could "spell disaster for credit card companies" and their grip on their "$21.6 trillion" global market. The innovation? Near-field communication, more commonly abbreviated to NFC, which is the technology that allows you to make in-store payments using a smart device. It's actually a low-power wireless link, which is used to transfer small quantities of data between two devices positioned a few inches apart. In this case, one of them is your smartphone or tablet and the other is an enabled point-of-sale (POS) terminal. Obviously, you have to first load a "digital wallet" app onto your device, which is supposed to keep your plastic's details safe, and provide a secure platform for transactions. 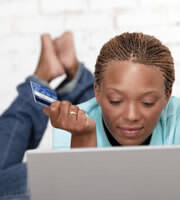 You also have to link your wallet to one or more debit or credit card accounts. Experts have been forecasting the mass adoption of digital wallets for roughly a decade, and many big-name companies, including Google and PayPal, have launched their own versions. However, the market largely remains a niche one for early adopters. That's partly because consumers are unconvinced by wallets' advantages, not least because too few retailers have those NFC-enabled POS terminals, and partly because retailers are unconvinced, not least because too few consumers have digital wallets. It's a vicious circle. Apple Pay a game changer? You take a picture of the credit card you want to add to your wallet using the phone's camera. To pay, you just hold the device near the POS terminal, and touch the screen. The phone uses fingerprint identification technology to authorize payments, so it should be somewhere between incredibly difficult and impossible for anyone other than you to use it. Better yet, it doesn't share your card details with merchants. Instead it sends "a device-specific one-time payment number and a dynamic security code:" a unique token, if you will, to enable the transaction. That means the hackers who stole millions of cards' data from Target and Home Depot would have gotten nothing useful from Apple Pay users, if only the technology had existed when those crimes were committed. Your card account details aren't stored on the phone. A unique Device Account Number is assigned, and encrypted on a dedicated chip. If you lose your phone or it's stolen, you can use the Find My iPhone online service to remotely make its contents inaccessible, or to completely wipe it clean of all your information. Of course, that's Apple's take on its offering, and no doubt the company's many critics are going to be getting in line to pull apart its claims. But there seems no doubt that the iPhone 6 wallet addresses many of the concerns that have put consumers off previous products. Whether or not you personally are a fan, it's undeniable that Apple has unique credibility, trust and loyalty among a large number of affluent consumers. Many of the wealthiest and most desirable customers may be dipping their toes into the digital-wallet pond in the next few months and years, and retailers ignore those at their peril. Credit card companies want you to use their products. Some might incentivize you to make one of their cards your wallet's default payment choice. They may also incentivize retailers to invest in NFC-enabled POS terminals. Merchants are currently having to replace their POS terminals anyway because of EMV, the chip-and-PIN or chip-and-signature technology that should see microprocessor chips on 96 percent of credit cards by 2018. The Apple launch may well nudge many of them to invest a little more now, so they have NFC terminals that could better meet their long-term needs. Consumers are going to continue to carry little plastic rectangles in their actual wallets until almost every retailer is able to accept digital wallets. And some, mainly older, consumers -- those who self-identify as traditionalists or technophobes -- are never going to want to use smartphones to make payments, or maybe even to make calls. So plastic cards aren't likely to die off completely for decades -- or maybe ever. And, even if they ever do disappear, there are still likely to be banks and credit card companies behind the products that digital wallets contain. Apple has done deals with American Express, MasterCard and Visa -- and with the six mega-card issuers that it reckons account for 83 percent of all credit card transactions. It hasn't, at least so far, tried to muscle in on their businesses. So those little plastic rectangles may in the distant future disappear into the virtual ether. But there's little evidence that the companies that issue them are going to do so too. Absent much more evidence, you'd be a fool to think they're likely to. 0 Responses to "Is Apple Pay going to kill your credit card?"